STUDY OBJECTIVE Attitudes and practices concerning weight control in British adults were examined to test the hypothesis that variation in concern about weight and deliberate weight control might partly explain the socioeconomic status (SES) gradient in obesity. Higher SES groups were hypothesised to show more weight concern and higher levels of dieting. SETTING Data were collected as part of the monthly Omnibus Survey of the Office of National Statistics in March 1999. PARTICIPANTS A stratified, probability sample of 2690 households was selected by random sampling of addresses in Britain. One randomly selected person in each household was interviewed at their home. MAIN RESULTS As predicted, higher SES men and women had higher levels of perceived overweight, monitored their weight more closely, and were more likely to be trying to lose weight. Higher SES groups also reported more restrictive dietary practices and more vigorous physical activity. CONCLUSIONS The results are consistent with the idea that part of the protection against weight gain in higher SES groups could be a higher frequency of weight monitoring, a lower threshold for defining themselves as overweight, and a greater likelihood of deliberate efforts at weight control. Another possible factor contributing to SES differences in weight could be different attitudes to weight gain, and differential utilisation of weight control practices.23 Dieting has been found to be more common in higher SES adolescents24 25 and two studies in the US found higher levels of dieting in higher income adults.27 28 Eating disorder prevalence also shows a degree of social gradient,26 which may reflect the cost side of higher levels of weight concern. SES differences in attitudes to weight have never been investigated in population representative samples, and no studies of this kind have been carried out in the UK. The aim of this study was therefore to examine attitudes and practices concerning weight control in a representative sample of British men and women. Higher SES groups were hypothesised to espouse a lower “ideal weight”, monitor their weight more closely, be more likely to identify themselves as overweight, be more likely to try to lose weight, and use more recommended weight control strategies. Data were collected as part of the monthly Omnibus Survey of the Office of National Statistics in March 1999. In the Omnibus surveys, a stratified probability sample of women and men is selected each month by random sampling of addresses on the Postcode Address File of private households in Great Britain. Business and non-inhabited addresses are excluded (usually around 12%) and remaining households are visited by a trained interviewer. One randomly selected member of each household is selected for a computer assisted interview. (For details of the methodology see ONS Omnibus Survey).29 From a target sample of 2690 eligible addresses, 583 respondents refused to be interviewed and 213 were unable to be contacted after three attempts, so 1894 (70%) interviews were achieved. Occupational social class, based on the Registrar General's classification of the person's current or last occupation was used as the principal index of SES. People who have never worked are not classified in this scheme. Other demographic data recorded are shown in table 1. Weight and height were self reported and BMI calculated. Overweight status was defined as a BMI between 25 and 29.99, and obesity as a BMI over 30. Respondents were also asked to evaluate their weight on a scale from “very underweight”, through “somewhat underweight”, “about right”, and “somewhat overweight”, to “very overweight”. Ideal weight was ascertained by asking respondents “What would you ideally like to weigh?”. Ideal BMI was calculated as the ratio of ideal weight and reported height. Frequency of weighing was used as an index of the level of weight monitoring. Respondents were asked to say which of the following descriptions applied best to them: “not bothered about my weight”, “watching my weight to avoid putting on weight”, “trying to lose weight”, or “none of the above”. Results were analysed using analysis of variance and logistic regression from SPSS (version 7.4.1) for the continuous and categorical variables respectively, to compare anthropometric, attitudinal and behavioural differences between social class groups. As appropriate, age, smoking status and BMI were controlled for in the analyses. Interactions between gender and SES, and age group and SES were examined in the logistic regressions by including the interaction terms in the model. Obesity prevalence is higher in lower SES groups in Britain. The prevalence of feeling overweight and trying to lose weight are lower in lower SES status groups. Part of the protection against weight gain in higher SES groups might be the greater utilisation of deliberate attempts at weight control. Table 1 shows the demographic characteristics of the sample in relation to the SES groupings that are used in the subsequent analyses. Some occupations are not well classified in this system (for example, armed forces), people who have never worked are not classified, and in other cases information was missing, so data from 104 cases were not included in the SES analyses. In analysing the results, data for social classes 1 and 2 are combined, as well as 4 and 5, because of the smaller samples sizes. Few respondents were from ethnic minority groups, and the proportion did not vary by SES, so ethnicity was not included as a factor in the analyses. Age, self reported weight and height, BMI (kg/m2), and the proportions of the sample who are defined as normal weight (BMI below 25), overweight (BMI 25 to 29.99) and obese (BMI greater than 30) by social class are shown in table 2 separately for men and women. In univariate analyses, there was a significant linear association between SES group and BMI in women (F(1,848) = 6.5, p = 0.01), and a significant linear trend across SES groups for the prevalence of obesity (Mantel-Haenszel χ2 = 12.09, p < 0.001). Among women, the odds of being obese in the lowest SES category compared with the highest were 2.8 (95% C1=1.6, 82). Among men, BMI was lowest in the lowest SES group and there was no significant association between SES and the prevalence of obesity. The four social class groups also differed in relation to smoking prevalence and age, and as both of these are associated with weight, they were included as control variables in a multivariate analysis of the risk of obesity. With age and smoking status entered first as control variables, women in the lowest SES category were even more likely to be obese (OR = 3.2; 95% CI = 1.7, 5.9) than those in the highest SES category. No significant association between SES and obesity prevalence emerged for men. Weight related attitudes and behaviours are shown in tables 3 and4. Table 3 shows the proportions of men and women endorsing each option. Table 4 gives the odds ratios and 95% confidence intervals from logistic regressions controlling for age, gender and BMI, for each of the main outcome variables expressed in a binary form, with the highest SES group as the reference group. Where the confidence intervals do not include 1, the odds ratio is significantly different from the reference group. Data for men and women are combined in table4, as this maximises sample size and thereby improves the precision of the effect size estimates. Before combining the gender groups, we tested for interactions between gender and SES. The only significant effect was a marginal effect for perceived overweight (p=0.02) that emerged because men in group 3M had a lower perceived weight than the reference group, whereas women did not. There were no significant interactions with gender among the other variables. We also examined age group by SES interactions, and there were no significant interactions. As Table 3 shows, our prediction that ideal weights or ideal BMIs would vary systematically across social classes was not supported. In women there was a hint of an effect, with the lowest ideal BMI in the highest SES group, but in men the lowest ideal BMI was in the lowest SES group. Table 3 shows that half of the women (51%) and slightly fewer men (42%) felt that they were overweight. The proportion describing themselves as overweight was lowest in the lowest SES group among both men and women, but the linear association was significant only for men. The results of a multivariate logistic regression are shown in table 4(column 1), which controlled for gender, age and BMI. The lowest SES groups were significantly less likely to feel overweight than the reference group (the highest SES group), with intermediate odds ratios for the non-manual and skilled manual groups. The SES difference in perceived overweight is illustrated in figure 1A (women) and 1B (men), with respondents being divided into percentiles of BMI. 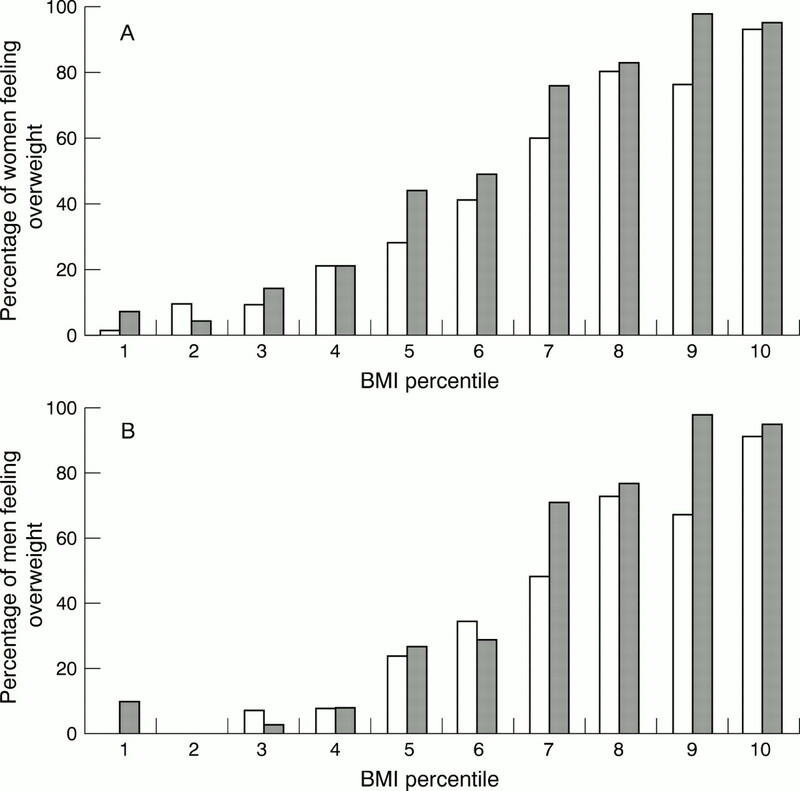 Percentages of women (A) and men (B) who perceived themselves as overweight or very overweight, in relation to BMI percentile and occupational social class. Darker bars represent data from the non-manual social class groups (1, 2 3NM) and lighter bars the manual groups (3M, 4, 5). Regular weighing (defined as at least monthly) was slightly less common among men than women and was less common in the lower SES groups (see table 3). The adjusted odds ratios (see table 4, column 2) indicate that the lowest SES group was significantly less likely to be monitoring their weight regularly, with graded odds ratios for the intermediate groups. For both men and women, there were more who were “trying to lose weight” and fewer who were “not bothered about their weight” among the higher social class groups (see table 3). This difference is all the more striking in view of the lower prevalence of obesity in the higher SES women. Results in table 4 (column 3) show that, after controlling for gender age and BMI, there was a significant graded effect across SES categories in the odds of trying to lose weight. These effects are illustrated in figure 2A and 2B. 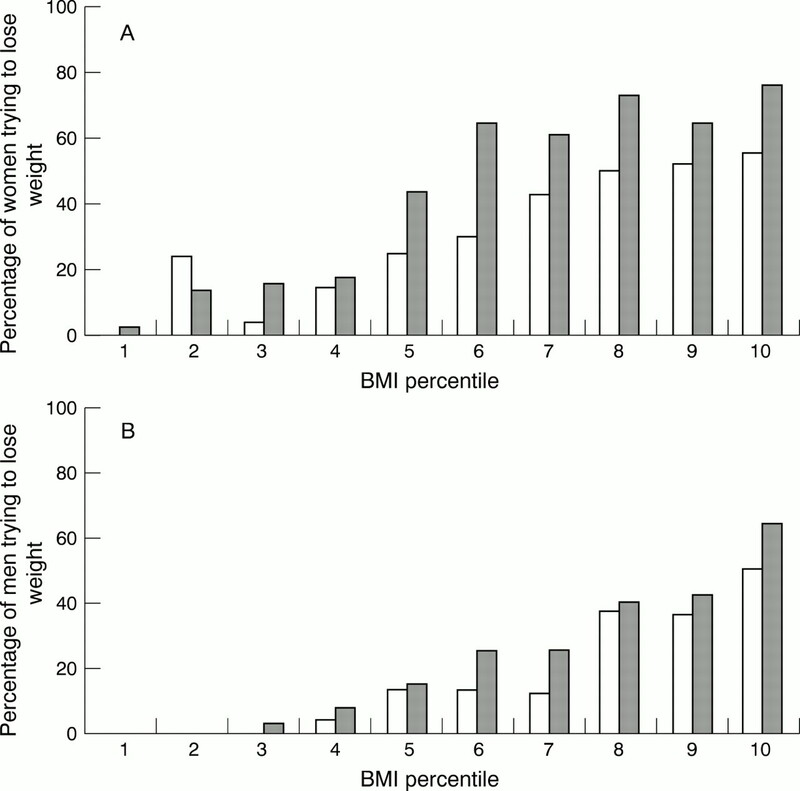 Percentages of women (A) and men (B) who reported trying to lose weight, in relation to BMI percentile and occupational social class. Darker bars represent data from the non-manual social class groups (1, 2 3NM) and lighter bars the manual groups (3M, 4, 5). “Watching your weight” seemed to be a commonly reported habit in the present sample, which did not differ across SES groups in univariate analyses. However, analysing data just from those whose BMI is below 25 (for whom weight watching might be a prudent practice) showed significant social class variation. Some 41% of normal weight men and 51% of women in the highest SES group were watching their weight, compared with 30% of men and 44% of women in the lowest SES group. More women than men carried out each dietary practice, so the overall “restrictive dietary habits” score was significantly higher in women (3.6; 95%CI 3.5, 3.7) than men (2.8; 95%CI 2.5, 2.9; t = 8.1, p < 0.001). Table 3 shows that restrictive habits were also strongly related to social class, with a significant linear effect for the restrictive habits score among both men (F = 12.7, p < 0.001) and women (F = 56.6, p < 0.001) in the univariate analyses. Multivariate analyses showed that the odds of practising at least three restrictive habits had a graded association with SES (see table 4). Some 32% of men and 23% of women reported regular vigorous physical activity (see table 3). There was little SES variation among men, but much higher levels of exercise in the highest SES women than the other three groups. In the multivariate analyses, the odds of regular exercise was significantly higher in the highest SES group than the other three groups. This is one of the first studies to use a nationally representative sample to evaluate the association between SES and attitudes and practices in relation to weight control. The results give some support to our prediction that men and women from higher SES groups would be more likely to try to control their weight, with many of the effects being graded across occupational categories. Higher SES men and women were more likely to perceive themselves overweight and monitored their weight more frequently despite their lower BMI and lower prevalence of obesity. They were also more likely to be trying to lose weight and reported more restrictive dietary habits and more regular physical activity. We had hypothesised that higher SES men and women would espouse a lower ideal weight, which we anticipated might “drive” the attitudinal and behavioural differences, but there was no evidence for this. Ideals for weight or BMI did not vary systematically across the SES groups for either men or women, so this could not explain the other differences. Given that higher SES groups were more likely to perceive themselves as overweight, this perception would not seem to derive directly from their view of ideal weight. One possible alternative explanation is that weight norms vary by SES because they come from the weights of people in the immediate social environment—family members, friends and colleagues—who are likely to come from the same SES group, and therefore likely to have a similar weight distribution. There is one paradox in the results, namely that observed SES differences in weight control were almost as striking for men as women, yet the social patterning of weight is negative only for women. One explanation is that in men with lower SES, other factors protect against weight gain. Occupational physical activity is a strong contender at present, as it is relatively higher in male manual than female manual occupations. However, this protection is likely to diminish as more work tasks become automated, and the SES distribution of obesity for men is likely to shift to being more like that in women. An important methodological issue emerges from using cross sectional data to examine causal hypotheses—in this case that either deliberate weight control, or variation in lifestyle, are the causal factors in SES differences in weight. Some of the published analyses of the causes of social variation in weight have tried to examine the mediation hypothesis by controlling statistically for lifestyle differences, and seeing if this reduces the magnitude of the SES difference in weight.27 28 Not surprisingly, this has failed to yield positive results because weight control efforts emerge as a consequence of being (or feeling) overweight, and hence in cross sectional studies are bound to be positively associated with weight. As such there is little chance that any mediating effect would be demonstrable. Longitudinal studies in which weight change is evaluated in relation to weight control practices, are needed to find out whether active weight control efforts really do reduce the weight gain that might otherwise be expected. The findings of this study are limited by it being based on self reported information both on dieting behaviour and weight. Self reported weights and heights tend to result in under-estimations of weight, especially among women, and over-estimations of height, especially in men, which in both cases would tend to underestimate BMI. Comparisons with data from the Health Survey for England,10 which uses measured weights and heights, suggests that this bias was shown in the present data. The average BMI in the present study was 24.7 in women and 25.3 in men, compared with 26.0 for women and 26.3 for men in the HSE. However, as the focus of the present study was SES differences, and the patterning of weight by SES was comparable in this dataset and the HSE, the shortcomings of reported weights and heights are not likely to materially affect the conclusions. Generalisation of the results is also limited by the fact that the response rate for the survey was around 70%, which is typical for the Omnibus surveys in the UK. Comparisons with census data suggest that there is slight under-representation of young people (between the ages of 16–25 years) and those of lower SES, which reflects the general trend within survey data that these groups are less available or willing to participate in government surveys.29 It is not immediately obvious how this would bias the social class comparisons, though it may over-estimate the overall level of weight concern in the population, if some of the less weight concerned sectors are under-represented. The study has the advantage of using interviews rather than a questionnaire, so it is probable that there was a more accurate ascertainment of the answers. All respondents were asked about the behaviours that might be relevant to weight control, so that it is possible to look at variation in weight control behaviours in relation to SES in the full sample. The sample was also large and fairly representative of the UK population, so within the limits of the method, it would seem reasonable to conclude that SES differences in weight attitudes and practices may play a part in SES differences in weight. The results certainly suggest that the issue deserves further study to establish the physiological significance of the observed behavioural differences, and to try to understand how the SES differences in attitudes to weight emerge in the first place. (1983) Obesity in young Dutch Adults: 1. socio-demographic variables and body mass index. Int J Obes 7:1–12. (1988) Secular trends in body mass index and skinfold thickness with socioeconomic factors in young adult children. Am J Clin Nutr 48:535–543. (1989) The relationship between social class status and body mass index in the Minnesota Heart Health Program. Int J Obes 13:59–67. (1992) Gender and race differences in the correlation between body mass and education in the 1971–1975 NHANES 1. J Epidemiol Community Health 46:191–196. (1993) Social status and health risks in Canadian adults: 1983 and 1991. Health Rep 5:143–156. (1993) Trends in body mass index and prevalence of obesity in Swedish women 1980–1989. J Epidemiol Community Health 47:195–199. (1996) Trends in body mass index and obesity among adults in Finland from 1972–1992. Int J Obes 20:114–120. (1994) The behavioural epidemiology of weight control. Aust J Public Health 18:143–148. (1988) Social class and changes in weight-for-height between childhood and early adulthood. Int J Obes 12:445–453. (1996) Health Survey for England (The Stationary Office, London). (1997) Obesty in Canada: a descriptive analysis. Can Med Assoc J 157 (suppl 1) S3–S9. (1990) The Dietary and Nutritional Survey of British adults. (The Stationery Office, London). (1997) Social inequality in coronary risk: central obesity and metabolic syndrome. Evidence from the Whitehall II study. Diabetologia 40:1341–1349. (1989) Educational level, fatness and fatness differences between husbands and wives. Am J Clin Nutr 50:740–745. (1993) Social and economic consequences of overweight in adolescence and young adulthood. N Engl J Med 329:1008–1012. (1994) Obesity and stature in adolescence and earnings in young adulthood. Arch Pediatr Adolesc Med 148:681–687. (1997) Health Survey for England: The Health of Young People 1995–97. (The Stationery Office, London). (1999) Smoking, drinking, physical activity and screening uptake and health inequalities. In Gordon D, Shaw H, Dorling D. eds. Inequalities in health. (Policy Press, Bristol), pp 213–239. (1995) Cardiovascular in Australia: trends in socioeconomic inequalities. J Epidemiol Community Health 49:363–372. (1993) The Health and Lifestyle Survey: seven years on. (Dartmouth Publishing, Aldershot). (1994) Dietary intake patterns and sociodemiographic factors in the atherosclerosis risk in communities study. ARIC Study Investigators. Prev Med 23:769780. (1996) Energy density and its role in the control of food intake: evidence from metabolic and community studies. Appetite 26:153–174. (1989) Socioeconomic status and obesity: A review of the literature. Psychol Bull 105:260–275. (1994) Body weight and dieting in adolescence: impact of socioeconomic status. Int J Eat Disord 16:61–65. (1990) Adolescent concerns about weight and eating: A social-developmental perspective. J Psychosom Res 34:377–391. (1996) Epidemiology of eating disorders. Psychiatr Clin North Am 19:681–700. (1994) Predictors of weight change over two years among a population of working adults: the Healthy Worker Project. Int J Obes 18:145–154. (1996) Socioeconomic status and weight control practices among 20–45 year old women. Am J Public Health 86:1005–1010. Office of National Statistics Technical Report.Omnibus Survey. London: 1999..
(2000) Intentional weight control and food choice habits in a national representative sample of adults in the UK. Int J Obes 24:534–540. (1991) Socioeconomic status differences in health behaviors related to obesity: the healthy worker project. Int J Obes 15:689–696. (1996) The dismantling of a myth: a review of eating disorders and socioeconomic status. Int J Eat Dis 20:1–12. (1992) A report on activity patterns and fitness levels. (The Sports Council and Health Education Authority, London). (2000) Nutrition knowledge and food intake. Appetite 34:269–275. (1984) Distinction: a social critique of the judgement of taste. (Routledge, London). Funding: this work was supported partly by a grant from the Economic and Social Research Council as part of the Health Variations Programme.